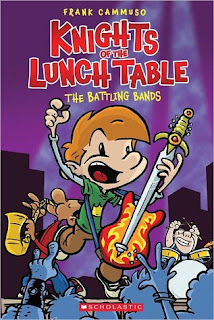 Description: A battle is looming at Camelot Middle School-a battle of the bands, that is! Artie, Wayne, and Percy enter the talent show seeking fame and fortune. But only one of them plays an instrument: Percy. And he plays the saxophone. Their only hope of winning is finding the long-lost "Singing Sword," the fabled instrument of awesome power. Jake's Review. Love it when you bring home these awesome books to read. This one is hilarious and I liked the story so much I didn't want to put it down. My favorite character is wing cause he is good at video games like me. I think Brian would like this book too because it is more like a comic book than a chapter book. The illustrations are funny too. I liked the part with the lunch ladies that was hilarious. Can't wait to read more of the Knights books.